What’s the Secret to a Great Sandwich? What is a Sando, you ask? A sando is slang for sandwich! Depending on where you’re from, you may call it a hero, hoagie, or grinder. But where I’m from, we call them sandos. And here’s some advice that’ll make you look way cooler when you come to Doghouse Pizza and see the word – Sandos on the menu. Whatever you do, don’t ask what a sando is. Don’t do it – Feel me? Just come here hungry and order your sando. Let us take care of the rest. Now- let’s get down to the real, real when it comes to the secret of a great sandwich. You need three basics: bread, some kind of meat, and some phenomenal toppings and condiments. The best sandwich ideas can come from anywhere -whatever floats your boat. The sky is the limit and you’re limited only by your thoughts and cravings. Speaking of creativity – how does this sound? A Triple-Decker Club: Slow-roasted turkey, house-baked ham, bacon, cheddar cheese, and LTO. Doesn’t that sound good? And it tastes even better! Excuse me – what is LTO?! Come on, man! LTO stands for Lettuce. Tomato. Onions. Got it? Great! Ham and bacon are just two of the tasty meats you can put in the starring role of your sando. Here are some more: Pepperoni, Sausage, Italian Beef, Gyro Meat, Chicken, and Pulled Pork. The Booya: Turkey, bacon, jalapeños, ranch, cheddar cheese, fries. Pollo Loco: Wang sauce, jalapeños, bacon, ‘lil ranch, cheddar cheese. 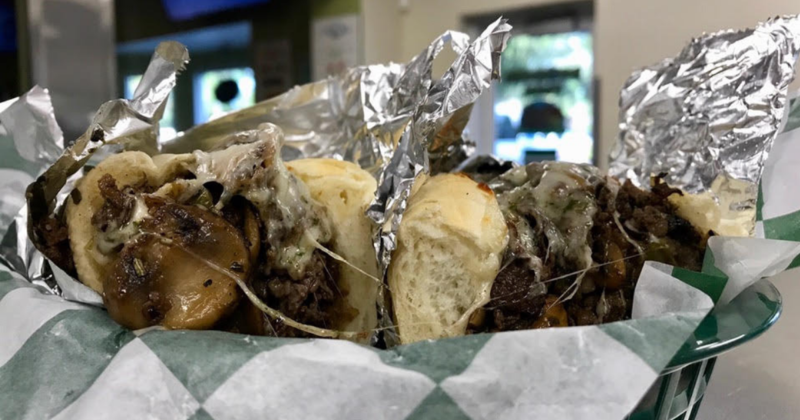 That Philly: Thinly sliced ribeye, mushrooms, peppers, onions, provolone. The Magoo: Turkey, roast beef, bacon, spicy mayo, provolone, fries. The Gut Buster: Italian beef, bacon, gravy, cheese curds, provolone, fries. jalapeños, black olives, ‘shrooms – aka – mushrooms, onions, green peppers, sliced tomatoes, and more- along with condiments: mayo, aioli, mustard varieties, and so much more. Now, you know we can’t share all of our secrets, right? Great- as long as we got that straight. But oh yeah – we will share a few more secrets to enjoying the best sandwich: chew slowly and devour each bite like it’s your last. Secondly, eat your meal in a friendly environment with great people and fun atmosphere, like Doghouse Pizza! Doghouse Pizza Serves Mouthwatering Sandos too! So – if you’re looking for an amazing sandwich, you’re right where you need to be. Come into our Melbourne, Florida restaurant and taste one for yourself. But, if you’re busy watching the game or just don’t feeling leaving the house, that’s okay too. We offer a delivery service through our bite squad. You’ll be using #getinmybelly before you know it!